Died: 24th March 1918; KiA. Date of Entry Therein – 24th August 1915 – Balkans. Commission – North Staffordshire Regiment – 24th April 1917. Regiment: North Staffordshire ‘Prince of Wales’ Regiment, 1st Battalion. Formerly 2151 Acting Sergeant, Royal Army Medical Corps. Relatives Notified & Address: Husband of Mrs E. J. Baldry, of 497, Ferndale Road, Swindon. 1891 84, Norwich Road, Ipswich. Edwin was 4 months old and living with his parents & sister. James William Baldry, 26, a Tobacconist & Assurance Agent, born St. Pancras, London. Christina Jane Baldry (nee Morris), 33, born Poplar, Middlesex. Lilian Mary Baldry, 2, born Ipswich. 1901 84, Norwich Road, Ipswich. Edwin was 10 years old and living with his mother, sister & step father. Walter Gibbon Finch, 55, a Carpenter & Joiner, born St. Leonard’s, Colchester, Essex. Christina Jane Finch, 43, a Tobacconist – own account. 1911 84, Norwich Road, Ipswich. Edwin was 20 years old, a Clerk – Agricultural Implement Firm. He was living with his mother & step father. Walter, 66, a Tobacconist & Newsagent – own accountant. Christina, 53, Assisting in Business. Edwin’s father James William Baldry died, September 1901, Ipswich. 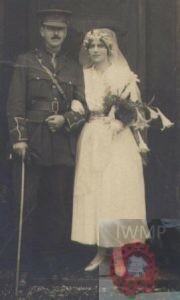 In 1917, Swindon, Wiltshire, Edwin married Dorothy Mabel Hewer, born March, 1892, Aldershot, Hampshire. 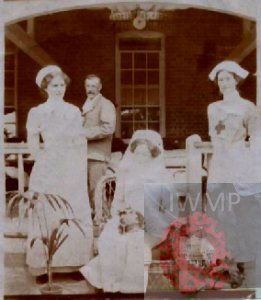 Mabel was a nurse at Greylingwell Hospital, Chichester during the war. Mabel is standing on the left. This is a relative of mine! I carried a torch in the Felixstowe parade and was thinking of all our family members who were in the war some survived and some sadly died.